Drum Roll! 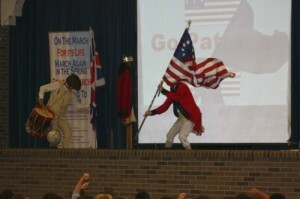 Students immediately feel the freedom call of fife and drum and march back in time with red coats in their midst. Learning flash! 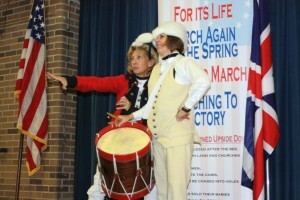 These red coats are musicians in George Washington’s Continental Army. 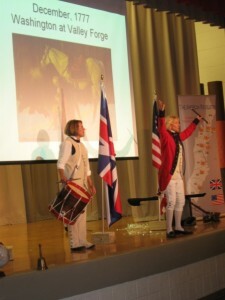 Students experience revolutionary stories and participate as patriots, loyalists, and courageous leaders in this world changing period of American history. Expect students to learn the music, important documents, dates, events, and personalities that continue to shape their country and lives. For optimum learning in the school setting, 40-100 students per session. Greater than 100 students requires a sound system. For programs in Performing Arts Centers of more than 300 students, the artist requests a one hour tech rehearsal in the theatre. Contact us for special pricing and funding opportunities for your school or community. Book a Revolution! “The 5th grade American history students just witnessed the most remarkable program called The World Turned Upside Down.